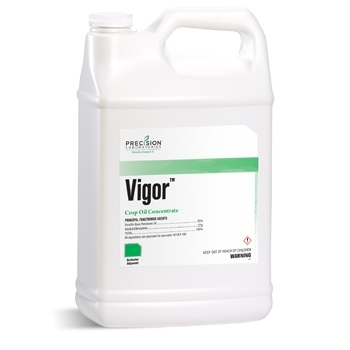 Vigor is a crop oil concentrate designed for use with herbicides requiring a paraffinic crop oil concentrate adjuvant. This superior formulation consists of a blend of highly unsulfonated paraffinic oil and premium quality surfactant. This blend utilizes the penetrating and nonevaporative properties of horticultural oil and the wetting and coverage characteristics of a complex surfactant blend. Vigor will increase the activity of herbicides and enhance performance. Therefore, care must be taken in treating crops during periods when plants are subjected to drought stress, high temperatures and high humidity. ¹Use the higher rate when weeds are under weather stress or at the maximum labeled size for control. Or apply 1.0% v/v (1 gallon of VIGOR per 100 gallons of spray solution) per pesticide label recommendations. ²Use higher concentrations for lower water volumes.